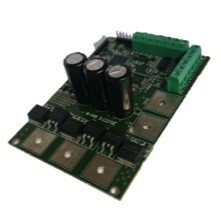 This project required an intelligent motor controller to drive a brushed DC linear actuator in an automotive application. Being automotive, the controller had to be powered from battery. The application required exceptional robustness as well as reliability and the inclusion of a range of safety features. We worked closely with the customer to develop flowcharts of the performance requirement and how the user would interact with this. These flowcharts were then expanded to include key safety critical features, including shutdowns and fault warnings. The controller includes 4 optically isolated inputs to protect against potential voltage spikes from the battery. It also included stall detection, active current monitoring as well as a range of fault outputs. Under voltage protection was also included in order to protect the user of potential issues that can be caused by either a low or flat battery. These features allow for constant monitoring of the status and performance of the system as well as providing peace of mind for the user. The pre-agreed fault output system also allowed engineers and those servicing the full system to make quick diagnoses if and when any issues occur. After discussions with the customer it was decided to go with a four quadrant control. This was chosen as it provides more reliable positioning control than a simple 2 quadrant system. In addition, the added efficiency that can be gained from four quadrant motor control was also an important factor, especially given the battery powered nature of the application. Given that this was the most accurate solution available it was also more desirable from a performance point of view as the accuracy of control of the actuator was critical to the performance of the application. Optional plug in modules were an important consideration when developing this design. Communications protocols such as CANbus and EtherCAT were both thought to be potentially important future additions by the customer and it was therefore decided allow for this option. This flexibility and future proofing of the design was considered hugely important by the customer and so a large amount of time and thought was put into ensuring the controller could be quickly upgraded, added to or modified in order to produce the desired results. There were several important challenges with this controller. Energy efficiency and safety were perhaps the two most important immediate considerations whilst future proofing and application flexibility were also key considerations for the customer. When working with batteries as a power source there are also a number of other important safety and performance critical issues which had to be taken into account.